What calls incredible numbers of beautiful and delicate creatures to launch themselves on amazing journeys that defy our inquiry? 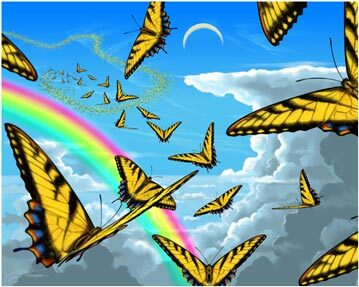 Here in some strange and unusual arrangement of weather, moon and sun, a mysterious force acts to direct this wondrous migration of butterflies in some unified effort to push their bodies above storms, high in the atmosphere, on their way to some grand and marvelous rendezvous with destiny. Perhaps beyond the horizon we might learn how delicate and precarious is our own realm as we hopefully pause in a timely enough way to see what it is we are in the midst of. The rainbows of our future may hold the key to a brighter consciousness, if we can hold fast an appreciation of the fragility, rectitude and gravity of life.